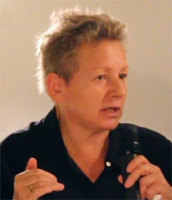 Monika Płatek is a lawyer and lecturer who works as an associate professor at the University of Warsaw, where she previously served as the deputy director of the Institute of Criminal Law. Monika has spent several periods of her academic career abroad, either as a visiting professor or a scholar, on diverse scholarships, including the celebrated Fulbright and Max Planck Institute awards. Back in Poland, Monika founded and remains president of the Polish Association of Legal Education, she has sat on the board of the human rights association Panoptykon and served as a commissioner on the Polish ombudsman for the protection of the rights of victims of crime. She is also well known for her advisory work for Polish parliamentary committees, the Open Society Institute and the Council of Europe. For these many engagements, she was awarded the Knight’s Cross of the Order of Polonia Restituta in 2012 and she has also been the recipient of awards for her work in the prevention of domestic violence, her contributions to penal reform and the exellence of her academic work and teaching. In her academic work, Monika specialises in human rights within criminal law enforcement, penal reform, victimology and the work of restorative justice. Subsequently, she has been extensively published in tomes looking at the treatment and protection of women within criminal law and publications, which analyse the reform of penal systems within Poland and Scandanavia.